Laura Leddy Turner began her writing career in 1976. She has worked in the newspaper industry as an illustrator, columnist, staff writer and copy editor, including with Gannett and the Asbury Park Press. Turner holds a B.A. in literature and English from Ramapo College of New Jersey, with postgraduate coursework in business law. Understanding the general rules and regulations of tennis is a first step to enjoying a sport you can play all year-round, with minimal equipment and just one other person. While there are slight rules variations between amateur and professional tennis, the object of the game is the same at all levels. The International Tennis Federation (ITF) is the sport's global governing body. It establishes specifications for equipment, court dimensions and surfaces, certifies officials and umpires, and maintains the rules. The United States Tennis Association (USTA) is a member of the ITF. Its duties include establishing rankings for American players at all age levels, organizing teams, developing programs and sanctioning tournaments. 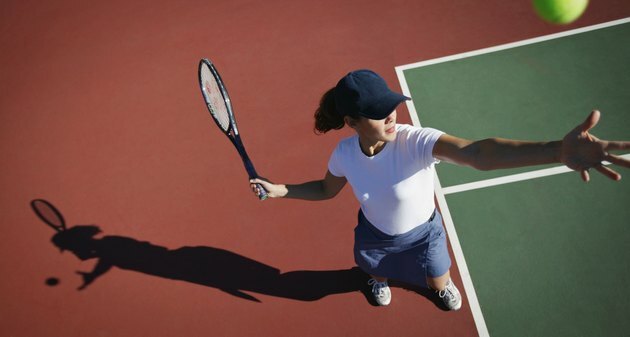 Nearly all public and private tennis courts are built to regulation size and specifications. Court dimensions are the same for hard court, clay or grass surfaces. If you're playing on clay, you may need to wear shoes with non-marking soles. If you're playing at a private club, it might enforce a dress code. Players are expected to use balls and rackets of regulation size, although junior players may play on smaller courts using modified equipment. Players can't attach anything to the racket or its strings aside from a vibration dampener. Singles tennis is played between two opponents. Doubles consists of two-person teams. The alleys, or the outermost spaces that run the length of the long end of the court, are in bounds in doubles play, but out of bounds in singles. Canadian doubles and Australian doubles are recreational variations for three players. In both, two people play against one and rotate so each one gets a shot at the singles position. Players typically toss a coin to decide who will serve first. The server stands behind the base line, between the center mark and the alley lane. The server cannot step on or over any lines while serving. The server must toss the ball upward and hit it over the net into the box diagonally across from him. The server gets two chances to make a good serve. Two failures means a "double fault," which gives the point to the receiver. The serve receiver has to return the ball after one bounce. He must hit the ball over the net, and it has to land within the alley lines and the base line. When it gets returned, the receiver can hit it back before it lands or after one bounce. The ball remains in play until it bounces twice before being hit, is hit out, or fails to go over the net. Love equals zero in tennis. It takes four points to win a game, though the scoring goes 15, 30, 40 and game. A score of 30-love indicates the server has won two points and the receiver none. If players tie at 40, the game goes to deuce. Play continues until one player wins two consecutive points. The first player to win six games by a two-game margin wins the set. If the players tie at 6-6, a tiebreaker is played. The first to reach seven by a two-point margin wins the set. Matches typically played in a best of three sets or best of five sets format.